The Erskine Fire is burning in the Lake Isabella area of Kern County. Cause: The fire started on BLM managed public lands at the junction of Erskine Creek Rd and Apollo Way at approximately 3:51PM Thursday, June 23d. The cause of the fire is under investigation. Closeout will be at Bakersfield BLM office on July 3, 2016 at 1000 hrs. Soft road closures are in effect for Kelso Valley at Kelso Creek, Goat Ranch Rd. at Jawbone Ave., and Fiddleneck St. at Foxtail Pine Dr.
Road closures are in effect for Kelso Valley at Kelso Creek, Goat Ranch Rd. at Jawbone Ave., and Fiddleneck St. at Foxtail Pine Dr.
Road closures: Hwy 178 is closed at Hwy 155 and Sierra Way. Evacuations are in effect for: Bella Vista, South Fork, Weldon, Onyx, Lakeland Estates, Mountain Mesa, South Lake, Squirrel Valley, and Yankee Canyon. Residents in the Lake Isabella and Erskine Creek area should prepare for possible evacuation. Additional evacuation information will be posted when it is available. Evacuations remain in effect for Bella Vista, South Fork, Weldon, Onyx, Lakeland Estates, Mountain Mesa, South Lake, Squirrel Valley, and Yankee Canyon. Hwy 178 is closed at Hwy 155 and at Sierra Way. Kernville Elementary School is now the primary shelter for evacuees. There are approximately 125 evacuees at the elementary school. The Red Cross Safe & Well site is available for those looking for loved ones affected by evacuations:https://safeandwell.communityos.org/cms/index.php. Current recommended evacuation - Hwy 178 to Kelso Valley to Piute. Evacuation centers are Kern Valley High School and the Lake Isabella Senior Center. Road closures are in effect for portions of Highway 178. Precautionary evacuation order is in place for Lake Isabella. Re-entry plan has been implemented. Continued threat for communities of South Lake and Bull Center. As well as portions of Hwy 178 and the Kelso Valley. South Lake, Lake Isabella, and the Weldon area. Yankee Canyon, Mountain Mesa, and areas of East South Lake along Hwy 178. 06/26/2016 1930: 43,460 Acres, 40% contained. 250 structures have been destroyed and an additional 75 damaged. Continued threat to life and properties including the communities of Mountain Mesa, South Lake, Lakeland Estates, and Bull Center. Continued threat to life and properties in surrounding areas. 06/24/2016 1930: 30,000 acres, 5%, 2 dead, 100 structures lost and 1,500 additional structures threatened. The fire is currently estimated at 30,000 acres and is 5% contained. There are approximately 800 fire fighters on scene, with several hundred more in route to the fire. The Pacific Crest Trail is closed from Walker Basin Campground to Jawbone Canyon Road. California Team 5 will take command of the fire at 8pm this evening. Approximately 100 structures have been lost and 1,500 additional structures are threatened. Additional information on structure damage will be posted as damage assessment teams are able to confirm details. Firefighters are working hard today in very hot and dry conditions and steep terrain. Three firefighters have suffered smoke inhalation injuries. The Bureau of Land Management, U.S. Forest Service, and Kern County Fire District are in unified command. Many other agencies are assisting, including CalFire, Red Cross, Caltrans, animal control, and law enforcement from local, county, state, and federal agencies. A Type I incident management team is in route. will assume command 06/24 @ 2000.
infrastructure in the surrounding areas. Commitment of Forest Service air & ground resources. 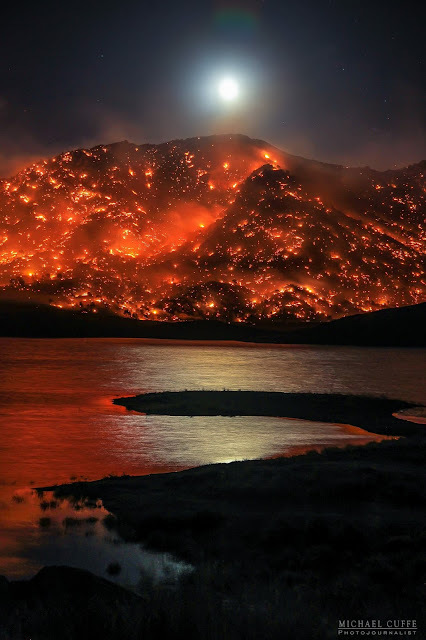 06/24/16 0800: The Erskine Fire is burning in the Lake Isabella area of Kern County. The fire is currently estimated at 8,000 acres. Approximately 100 structures have been lost and 1,500 additional structures are threatened. Additional information on structure damage will be posted as damage assessment teams are able to confirm details. There are currently 350 fire fighters on scene, with several hundred more in route to the fire. Three firefighters have suffered smoke inhalation injuries. Heat, steep and rugged terrain, wind and a fast moving fire are all challenges facing firefighters. Today there will be 6 airtankers, including a VLAT, and 7 helicopters on the fire. Additional air resources are in route. Kernville Elementary School is now the primary shelter for evacuees. There are currently approximately 125 evacuees at the elementary school. The Red Cross Safe & Well site is available for those looking for loved ones affected by evacuations: https://safeandwell.communityos.org/cms/index.php. The Bureau of Land Management, U.S. Forest Service, and Kern County Fire District are in unified command. Many other agencies are assisting, including Red Cross, Caltrans, animal control, and law enforcement from local, county, state, and federal agencies. 06/23/16 1730: 500-1000 acres unconfirmed reports of structures lost plus many threatened. 06/23/16 1630: IC ordering 10 Strike Teams of Type 3s and 4-5 Strike Teams of Type 2s 400-500 homes immediately threatened. 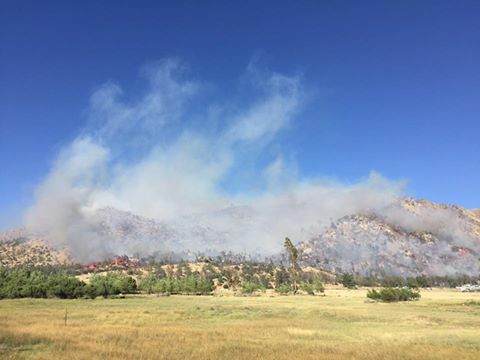 06/23/16 1615: #ErskineFire IC ordering a medium task force immediate need for structure protection in #OakMeadows 4 Tankers, 1 Helitanker, 2 Type 2 Helicopters and 1 Air Attack for Air resources assigned. Cause is under investigation.